The Book Chook: Children’s Book Review, Du Iz Tak? Children’s Book Review, Du Iz Tak? Du Iz Tak? was written and illustrated by Carson Ellis, and published in Australia by Walker Books (2016.) RRP: $Au24.99. I have previously reviewed Ellis’ picture book, Home. First, Carson Ellis explored the many possibilities of home... now she turns her eye to the natural world. The invented, nonsensical language is hugely fun to read aloud (even though you don't know exactly what you're saying!) - it's BUG language! Children will delight in following the various funny episodes exquisitely captured in Carson Ellis's trademark colour palette. Some kids are going to love this almost wordless children's picture book; others will be bewildered by it at first. I think it needs careful introduction and promotion. Some of us don’t want to be challenged or nudged outside of our comfort zone when we read, but having someone lead us always helps. 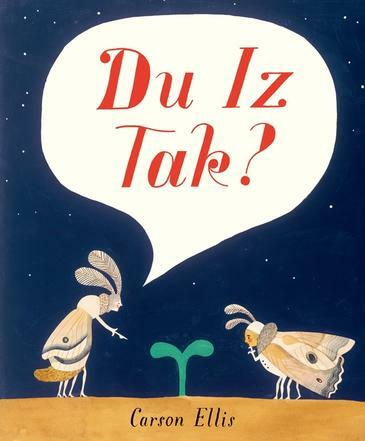 Once children realise an invented language is a lot like a guessing game, I think they will embrace Du Iz Tak and relish using all their inference skills to make sense of the story. It follows the discovery of a sprouting plant by some bugs, and their subsequent use of it to build their own treehouse/fort. The arrival of a huge spider causes problems, but nature has a few tricks up her sleeve, thankfully. Behind the almost wordless narrative, we gain an appreciation for the ever-changing cycle of life in the Bug kingdom and beyond. There will be lots of opportunities for discussion when adults share the book with kids. For instance, when three little bugs stand at one end of a log and each calls “Icky!” and on the next page we see the door on the log open, and the bugs say to someone inside: “Icky, ru badda unk ribble.” what can we infer about the name of the log-dweller? The vaguely Germanic language might be able to be completely translated, but it doesn’t need to be to enjoy the story, and kids will take great pleasure in declaiming it, I’m sure. I love Ellis’s illustration style. The details and whimsy will result in children begging to share Du Iz Tak? with their friends, and I foresee lots of discussion in bug talk too. I particularly liked the rich colour palette and patterning Ellis used. Du Iz Tak? is certainly an intriguing new children’s picture book. It also makes an excellent resource for schools that know how important it is for children to learn visual literacy. I loved it, and hope you do too. Other (almost) wordless picture books I’ve reviewed are Mr Wuffles by David Wiesner, The Umbrella by Ingrid and Dieter Schubert, and The Gift by Deb Gilmartin. I'll be adding Du Iz Tak? to my list of Picture Books about Change, embedded below.